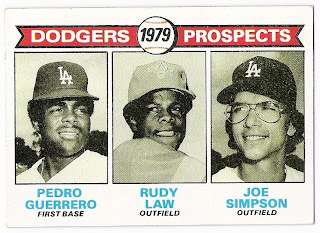 garvey cey russell lopes: the 1978 topps pedro guerrero card that should have been! the 1978 topps pedro guerrero card that should have been! we'll get to simpson's card that should have been soon, but this post is supposed to be about the birthday boy. 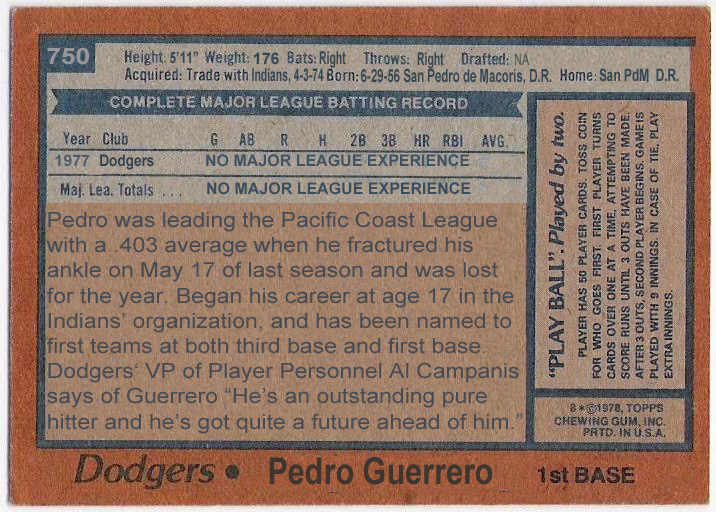 guerrero started in the minor leagues as a third baseman, but the dodgers moved him to first base when he went to aa in 1976. he was promoted to aaa albuquerque for the 1977 season and played first exclusively until he was injured as mentioned on the card back above. 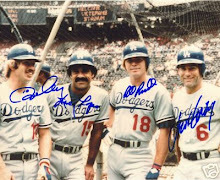 the dodgers, meanwhile, had a guy named steve garvey at first base, and the penguin at the hot corner, so guerrero was sol in that regard. 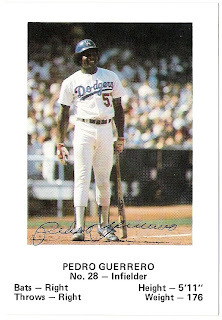 after a full year of aaa in 1978 as a first baseman, pedro played most of 1979 as an outfielder. before that, however, he enjoyed a september call up with the big blue wrecking crew. he debuted on september 22, 1978 as a pinch-hitter for rick sutcliffe and singled, later scoring on a reggie smith sac fly. 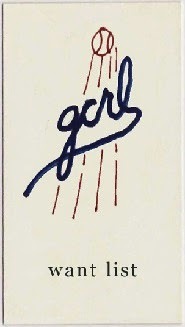 he next appeared four days later as a late-inning replacement at first for the garv, but didn't bat. he went 1 for 2 in each of his next two games, and finished the season in game 162 with a 2 for 3 performance after taking over for garvey in the bottom of the first. in all, guerrero's first taste of the big leagues resulted in a .625 average and on base percentage, three runs, a triple, and one rbi. after his debut, all of his appearances were at first base in relief of garvey. i will admit, i was a little concerned about this guy replacing my favorite player. 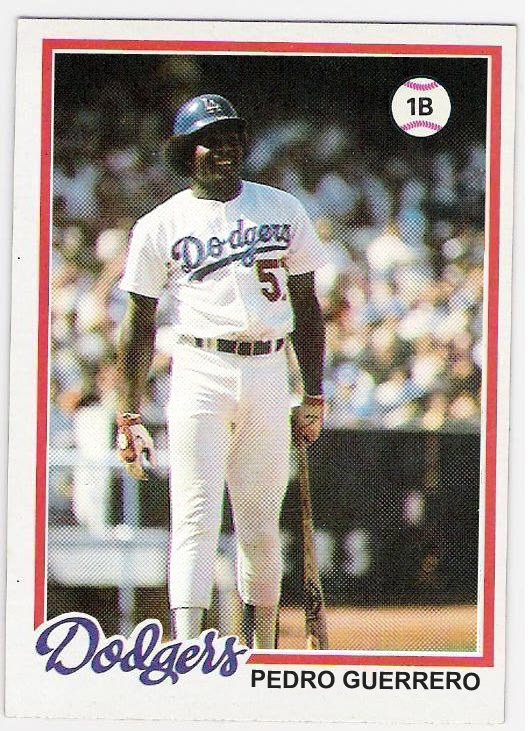 still, it was obvious that the dodgers had to find a place for him in the lineup. 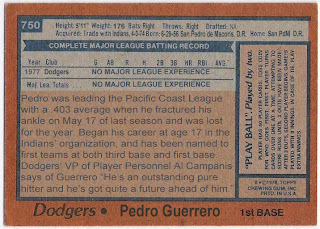 in 1979, guerrero was called up in may and again in september. he was a bench player in may, pinch-hitting and playing some first and third, but in september he made a number of starts, all in the outfield. 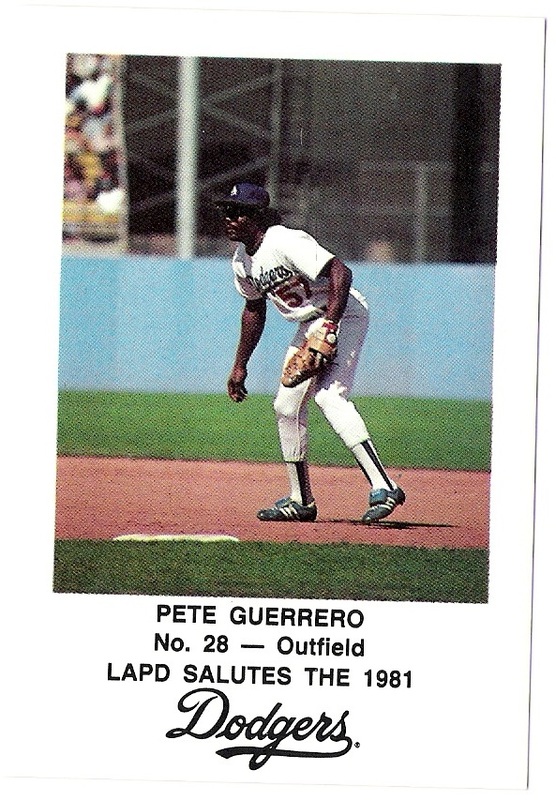 in 1980, he played all over the place - all three outfield positions, third, first, and even second base. that led to some confusion, as in 1981, his dodgers police card showed him at first, but listed him as an outfielder. it also referred to him as 'pete'. 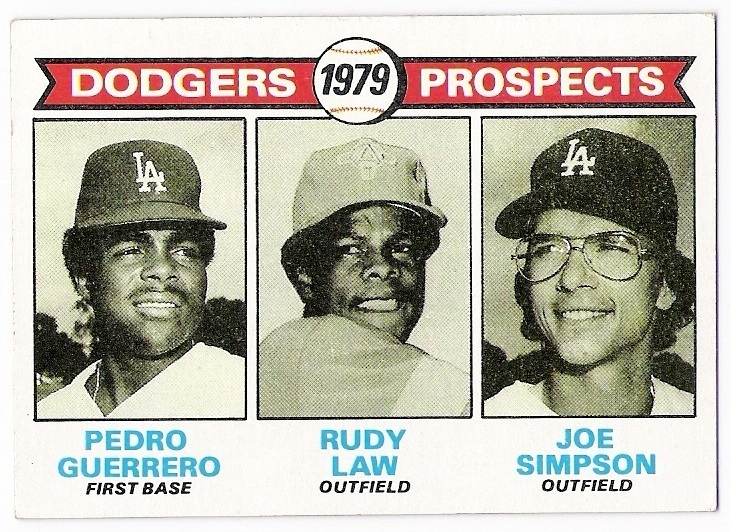 topps went a different route and listed him as 'of-3b-1b' even though he made more appearances at second in 1980 than at first and third combined. here's a copy of that 1981 topps card that he kindly autographed. 1981, of course, was when he came into his own and captured one-third of the world series mvp. 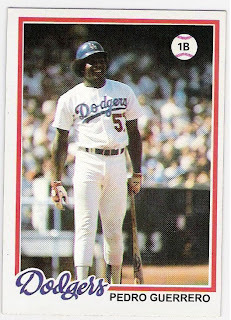 there was a feeling of a 'changing of the guard' with this young guy forcing his way into the veteran lineup, and soon davey lopes was gone and the team of my youth was forever changed. i don't resent guerrero (or saxy) though - his 1985 season was a thrill to follow, and john tudor really helped out in '88 as well. here's to you pedro! happy birthday and thanks for the memories. 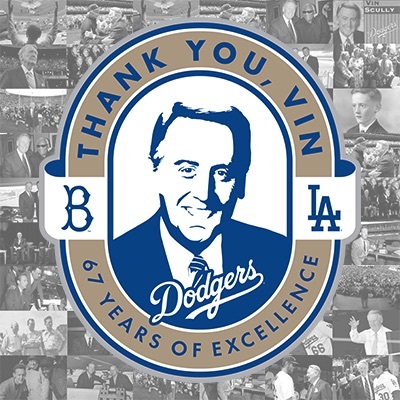 i'm glad you were a part of the 1978 dodgers. Great job on that 1978!